Enabling blind people to see again is the dream of many neuroscientists. We still have a long way to go to make this happen, but we have also made a lot of progress over the last twenty years, says Richard van Wezel of the Donders Institute for Brain, Cognition, and Behavior. He presented his research into the development of a 'prosthetic for blind people' on the occasion of World Sight Day (October 12th), an annual event that focuses attention on blindness and vision loss. Van Wezel and his colleague Marcel van Gerven belong to the NESTOR consortium, consisting of participants from a range of disciplines including neurobiologists and engineers specialized in microelectronics and wireless apparatus. NESTOR, which received a grant last November from NWO Applied and Engineering Science AES, is working on the development of a prosthesis that uses micro-electrodes to stimulate the brains of blind people to evoke phosphines. "These are phosphines, comparable to the stars you see when you stand up too quickly. Blind people can also perceive them," Van Wezel explains. "We use electrodes to stimulate the brain in such a way that blind people can have a limited form of vision to see what is happening in the world around them." It is a potential solution for people who have become blind because their eyes or optical nerves are no longer functional. "For this group, stimulating the visual cortex is the only option for restoring vision." "The beauty of the visual cortex is that it is organized very logically. In a sense, the visual cortex contains a map that we can use to evoke phosphines very precisely at certain locations. Even with a limited number of electrodes, you can create all kinds of patterns. We are still at a very early stage and are working with experimental animals, but our ultimate objective is to make this possible for blind people." Within the project, Van Wezel is focusing primarily on psychophysics: understanding the relationships between stimuli and perception. "I am especially interested in how much information you need to see certain things. We know that even a small number of moving points is sufficient for people to see the contours of a person or the layout of a room. For someone who sees nothing at all, even this limited vision can be extremely valuable." For Van Wezel, the cochlear implant is one of the great success stories in neuroscience. "Worldwide, more than 300,000 people have benefited from cochlear implants, but I expect it will be several decades before visual implants become so widespread. Many attempts have been made, but few of them have succeeded." Nevertheless, the researcher is optimistic. "Our starting position now is much better than 20 years ago, when trials with brain implants usually failed. Much more is now technically possible, due in part to artificial intelligence and developments in deep learning. Another positive note is that we now understand much more about the functioning of the brain and the retina." In the near future, Van Wezel also expects that gene therapy will provide solutions for certain types of hereditary eye diseases caused by a genetic mutation resulting in blindness. "At present, a great deal of research is being done with injections of genetic material into the eye to stop eye diseases. The developments are promising." However, Van Wezel argues that the greatest gains can currently be achieved in developing countries. "The majority of people in the world who are currently going blind are from developing countries in which no money or suitable treatments are available, for cataracts for example. This disorder requires relatively simple surgery, which is widely available in developed countries." Another project, known as Sixth Sense, is a very practical application of the type of research being conducted by Van Wezel and his colleagues. 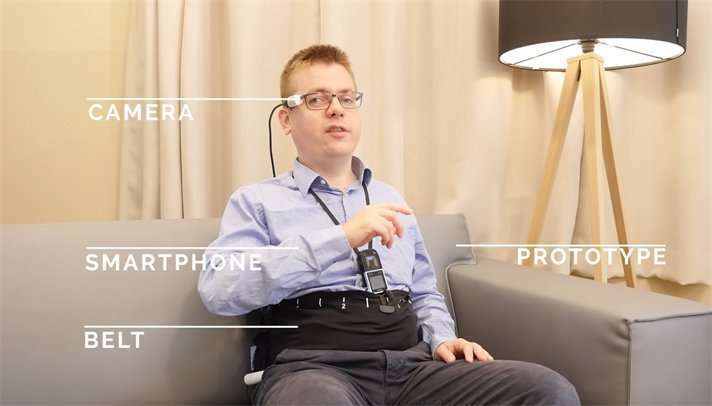 In cooperation with the University of Twente, a belt has been developed that can be worn around the abdomen and is linked to a smartphone and a camera that recognizes facial expressions. "Based on the emotion shown in the face of the conversation partner, the wearer feels certain vibrations. Half of our communication is nonverbal, and cannot be perceived by people who are blind or have low vision. A tool like this enables them to sense emotions that they cannot perceive otherwise."